China hopes to put a rover on Mars around 2020, complete a manned space station around 2022 and test a heavy carrier rocket around 2030, a top space scientist revealed on Sunday of December 7. 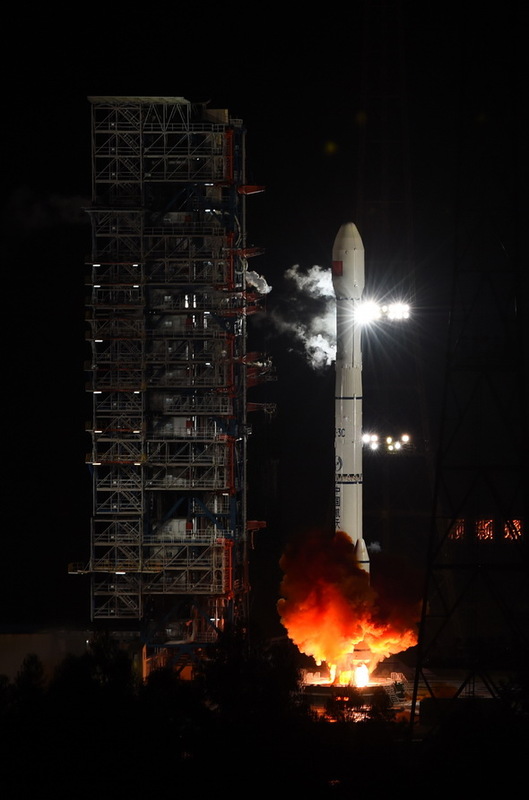 Lei Fanpei, chairman of the China Aerospace Science and Technology Corporation (CASC), the main contractor for the space program, revealed the details in an interview with Xinhua after the launch of CBERS-4, a satellite jointly developed with Brazil, from the Taiyuan base, by a Long March-4B rocket. It was the 200th flight of the Long March variants since April 1970 when a Long March-1 carried China’s first satellite, Dongfanghong-1, into space. A feasibility study on the country’s first Mars mission is completed and the goal is now to send an orbiter and rover to Mars. There has been no official announcement about a Mars probe yet, but Lei expects a Long March-5 carrier, still at the development stage, to take the orbiter into a Martian orbit around 2020 from a new launch site on south China’s island province of Hainan. China’s space scientists have had their eyes on the Red Planet as their next destination since the successful soft landing on the moon late last year. Last month, an actual-size model of a possible Mars rover was on display at Airshow China 2014, the first glimpse of how the vehicle might turn out. China made an unsuccessful attempt to reach Mars in 2011 aboard a Russian rocket, but failed to complete the mission because of an accident during orbital transfer. China’s manned space station program is progressing steadily. Various modules, vehicles and ground facilities are nearing readiness. Development and manufacture of major space products are at key stages, including the second space lab Tiangong-2, the Tianzhou-1 cargo ship, Long March-7 rockets and Shenzhou-11 spacecraft. The core module and two space labs will be tested soon, Lei said. A new launch center in Hainan, the fourth after Taiyuan, Jiuquan and Xichang, is almost complete and can already launch some spacecraft. The Tiangong-2 space lab will be launched around 2016 along with the Shenzhou-11 spacecraft and Tianzhou-1 cargo ship. Around 2018, a core experimental module for the station will be put in place. By around 2022, China’s first orbiting space station should be completed. It will consist of three parts — a core module attached to two labs, each weighing about 20 tonnes. Tiangong-1 was launched in September 2011. In June 2012, the Shenzhou-9 executed the first manual space docking with Tiangong-1, another essential step in building a space station. A powerful carrier rocket is essential for a manned moon landing. “We hope to make breakthroughs within four or five years on design and key technology for the heavy carrier, a solid foundation for developing such a rocket,” he said. Breakthroughs are needed on the overall design of the rocket, including development of a 460 tonne thrust liquid oxygen and kerosene engine and a 220 tonne liquid hydrogen engine. The rocket is envisaged as having a payload capacity of 130 tonnes to low Earth orbit. Once in service, it will help with missions between 2030 and 2050, and secure China’s position in terms of space exploration and technology. China’s next generation carrier rockets using non-polluting propellants may fly as early as 2015, a top space scientist revealed on Monday of December 8. The rockets fueled by liquid oxygen and diesel as well as liquid oxygen and liquid hydrogen, will make their maiden flights within the next two years, Lei Fanpei, chairman of the China Aerospace Science and Technology Corporation, the main contractor for the country’s space program, said in an interview with Xinhua. The next generation will include the heavy Long March-5 and the smaller Long March-7. It will take about 15 years for an overall upgrading. The Long March-5 will have a payload capacity of 25 tonnes to low Earth orbits, or 14 tonnes to geostationary transfer orbit, about twice the current capacity, and could be a serious competitor to the U.S. Delta-4H. The Long March-7 will carry up to 13.5 tonnes to low Earth orbit or 5.5 tonnes to sun-synchronous orbit at a height of 700 km. It will carry cargo craft for the planned space station. Its maiden flight should be next year. The service module belonging to China’s unmanned lunar orbiter has reached the Earth-Moon second Lagrange Point (L2), the State Administration of Science, Technology and Industry for National Defense said on Saturdayof November 29. As of Friday, the service module had been flying for 28 days, and was 421,000 kilometers away from Earth and 63,000 km from the moon. All experiments are going well. The service module was separated from the return capsule of China’s test lunar orbiter, which returned to Earth on November 1 after circling the moon in its eight-day mission launched on October 24. It was the world’s first mission to the Moon and back in some 40 years, with China becoming the third nation to do so after the Soviet Union and the United States. After two orbital transfers, the service module re-entered the elliptical orbit with an apogee of 540,000 km and a perigee of 600 km. During the flight, the service module again performed orbital transfer actions twice, and flew along the pre-set Earth-moon transfer orbit. On November 23, it reached the perilune and with the lunar gravity it was able to undertake the orbit maneuver to fly to the L2 point. 09, sets sail from Jiangyin City, east China’s Jiangsu Province, on November 25, 2014. 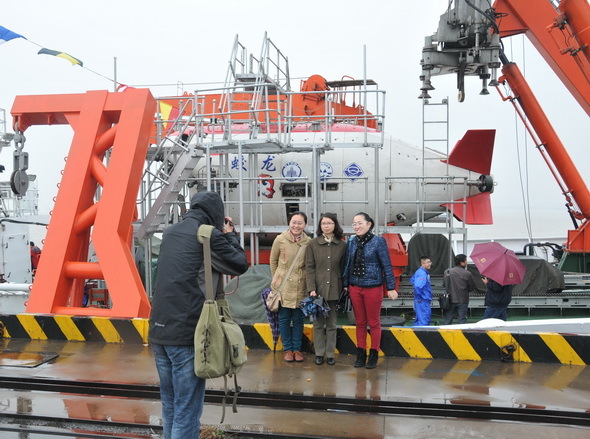 China’s deep sea manned submersible Jiaolong left Jiangyin in east China’s coastal Jiangsu Province on Tuesday of November 25, inside its carrier Xiangyanghong-9. The sub will conduct its maiden expedition as a science vessel in the southwest Indian Ocean. 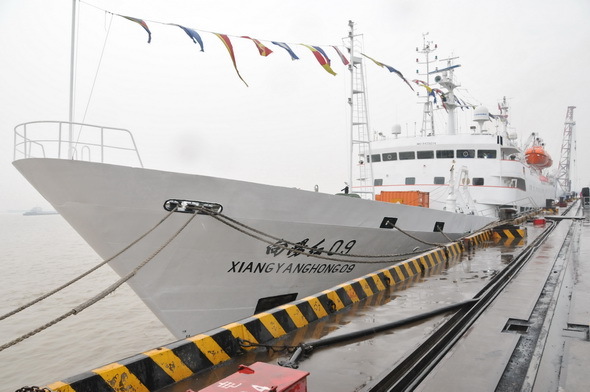 During the four-month mission, it plans to take 20 dives to research polymetallic sulfides, biological diversity, hydrothermal microbes and genetic resources, said the mission’s chief commander and director of the National Deep Sea Center, Yu Hongjun. This will be the furthest and longest voyage for Jiaolong in terms of distance and time. 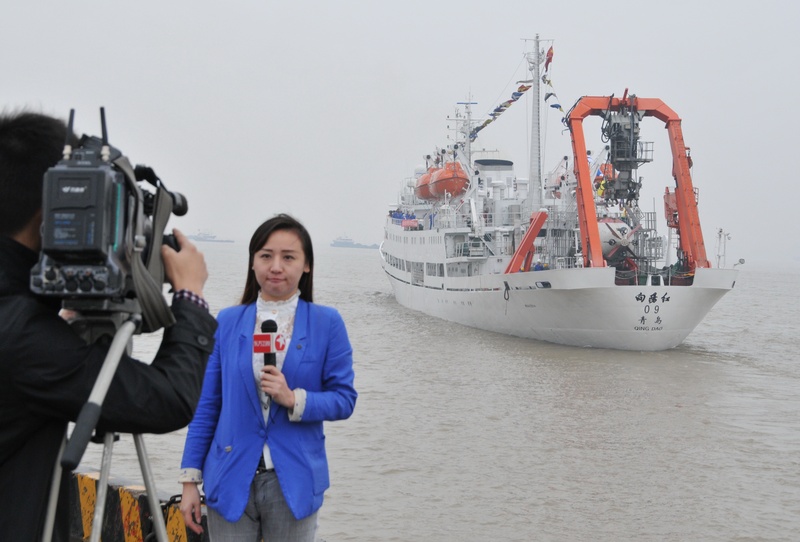 China’s ambitious ocean exploration program began in 2002. Named after a mythical dragon, Jiaolong has reached its deepest depth of 7,062 meters in the Pacific’s Mariana Trench in June 2012. There are a record number of 13 scientists working on this mission, despite reduced maintenance personnel due to technology rendering certain job obsolete. The scientists have undergone strict training to enable them to pilot Jiaolong back safely in case of an emergency. The country’s second cohort of aquanaut cadets, who were recruited late last year, will serve as copilot during the upcoming dives, marking their first participation into such missions, according to Yu. The voyage is considered a trial in nature for Jiaolong as it is not yet ready for regular operation. Its first trial exploration voyage from June to September last year marked the start of a five-year trial period for the submersible before it starts regular operation. During last year’s mission, Jiaolong explored the South China Sea and the northeast and northwest of the Pacific, accomplishing 21 dives. Jiaolong conducted a 52-day scientific expedition in the northwest Pacific Ocean earlier this year to survey cobalt-rich crusts and life forms inhabiting the bottom of the sea. 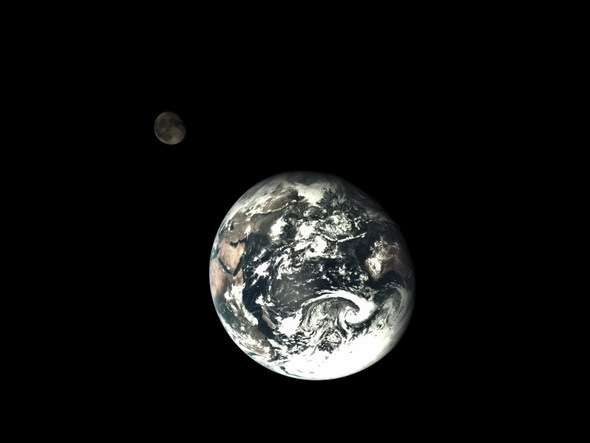 China on Monday of November 10 published photos of the Earth and Moon together taken by the orbiting service module of the country’s returned unmanned lunar orbiter. The photos were taken on Sunday of November 9 by the service module at a point 540,000 km from Earth and 920,000 km from the Moon after it was separated from the return capsule of China’s test lunar orbiter on November 1, ending its eight-day mission. The service module went back into orbit and conducted more tests after the November 1 separation about 5,000 km above Earth, said a statement from China’s State Administration of Science, Technology and Industry for National Defense, which released the photos. Launched October 24, the orbiter traversed 840,000 km in eight days in a mission that saw it go around the far side of the Moon. One of the biggest challenges was a “bounce” during the orbiter’s re-entry as it made its way home, as the orbiter must enter the atmosphere at a very precise angle. An error of 0.2 degrees would have rendered the mission a failure. To help it slow down, the craft is designed to “bounce” off the edge of the atmosphere before re-entering again. The process has been compared to a stone skipping across water, and can shorten the “braking distance” for the orbiter, according to Zhou Jianliang, chief engineer with the Beijing Aerospace Command and Control Center. The program is a test run for the final chapter of the country’s three-step lunar program, which includes orbiting, landing and returning. The latest mission is to obtain data and validate re-entry technology such as the heat shield and trajectory design for a future landing on the Moon as part of the Chang’e-5 mission, expected to be launched around 2017 to collect lunar samples and return to Earth. If successful, China will become the third nation to do so. China succeeded on Saturday of November 1 in the world’s first mission to the Moon and back in some 40 years, becoming the third nation to do so after the former Soviet Union and the United States. 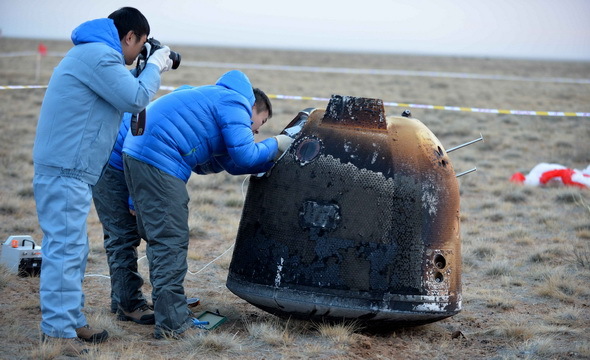 The test lunar orbiter, nicknamed “Xiaofei” on Chinese social networks, landed in Siziwang Banner of China’s Inner Mongolia Autonomous Region early Saturday morning. The high speed led to hefty friction between the orbiter and air and high temperatures on the craft’s exterior, generating an ion sheath that cut off contact between ground command and the orbiter. To help it slow down, the craft is designed to “bounce” off the edge of the atmosphere, before re-entering again. The process has been compared to a stone skipping across water, and can shorten the “braking distance” for the orbiter, according to Zhou Jianliang, chief engineer with the Beijing Aerospace Command and Control Center. The “bounce” was one of the biggest challenges of the mission, because the craft must enter the atmosphere at a very precise angle. An error of 0.2 degrees would have rendered the mission a failure. The eight-day program is a test run for the final chapter of China’s three-step–orbiting, landing and finally returning–lunar program. “Xiaofei” is obtaining data and validating re-entry technology such as the heat shield and trajectory design for a future landing on the moon by Chang’e-5. Earlier reports said Chang’e-5 will be launched around 2017. The goal is to collect samples from the Moon and return to Earth. If successful, China will become the third nation to do so. Calling “Xiaofei” a pathfinder for Chang’e-5, Zhou Jianliang said the data acquired by the lunar orbiter will optimize technology for Chang’e-5. Hao Xifan, deputy chief of China’s third phase lunar exploration program, also said the mission validated ground support capacities, craft landing technology and recoverable spacecraft technology. According to Wu Weiren, chief designer of China’s lunar exploration program, Chang’e-5 is expected to collect a 2-kg sample from two meters under the Moon’s surface and bring it home. Aside from the high-speed re-entry, major technological challenges for the craft center on surface sampling, taking off from the Moon, and lunar orbit rendezvous, Wu said. China launched a pair of orbiting lunar probes and last year landed a craft on the moon with a rover on board. Saturday’s success is another step forward for China’s ambition that could eventually land a Chinese citizen there. Few countries can rival China’s space program although China never intended to participate in any “space race”. In an earlier interview with Xinhua, Wu Weiren said lunar probe technology and software could be of great economic value if adapted for commercial use. Commercial gains aside, the space program is already a marker of China’s global stature and technical expertise. The Chang’e lunar probes – named after a goddess who took her pet Yutu, or jade rabbit, to the moon – are a symbol of great national pride. The country sent its first astronaut into space in 2003, becoming the third nation after Russia and the U.S. to achieve manned space travel independently. In 2008, astronauts aboard the Shenzhou-7 made China’s first space walk. There are plans for a permanent space station, expected to be set up around 2022. The Chang’e-1 and Chang’e-2 missions in 2007 and 2010 respectively, capped the orbital phase of the three step project. Chang’e-1 crashed onto the Moon’s surface at the end of its mission, and Chang’e-2 was sent into deep space to become China’s first man-made asteroid. The ongoing second phase saw Chang’e-3 soft land on the moon carrying moon rover Yutu in December 2013. Chang’e-4 was a backup for Chang’e-3 and has not been deployed. In the meantime, Yutu has entered its 11th dormancy earlier October, although its functions have degraded considerably after it encountered control issues in January this year. 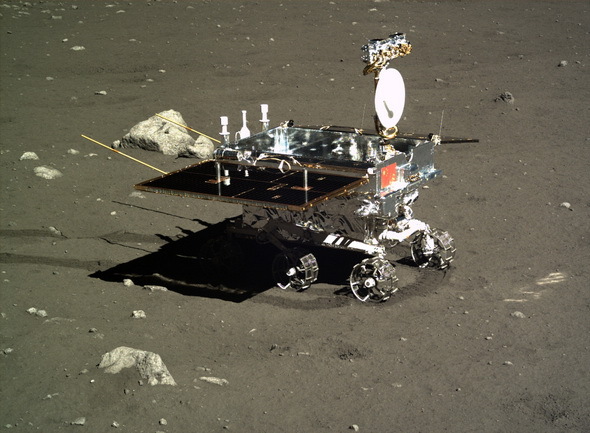 Experts had feared that it might never function again, but Yutu has stubbornly managed to wake up from its sleep mode ever since. None of those missions were intended to return to Earth and this has pushed the 2017 mission further into spotlight. “The Chang’e-5 mission will be yet another historic moment for China’s lunar program,” Wu said. Hong Kong Chief Executive C Y Leung on Saturday of November 1 congratulated the country on the smooth landing of the test lunar orbiter of the third phase moon exploration program in Inner Mongolia Autonomous Region. This is China’s first successful mission to the Moon and back, making it the third nation to do so after the former Soviet Union and the United States. “The success of this return has laid down a solid foundation for the third phase moon exploration program and is significant to the development of space mission,” Leung said. The head of China’s lunar probe program has called for a thorough analysis of data collected from the test lunar orbiter, which returned on Saturday of November 1, to speed up work on Chang’e-5, the star of the 2017 lunar mission. With the test lunar orbiter landing early Saturday in north China after an eight-day flight, China joined the Soviet Union and the United States and became the third nation to realize a return mission to the Moon. “The mission was realized with stable flight and precision in launch timing, orbit entry, recovery, and all pre-set goals were achieved,” said Xu Daze, also head of the State Administration of Science, Technology and Industry for National Defense, on Sunday at a cermony for the reception of the orbiter. According to Xu, the mission marked a “breakthrough” in the third and final phase of the lunar schedule — orbiting, landing and return — and had heighened understanding of high-velocity re-entry mechanisms, development of new materials and innovative space equipment design. Chang’e-5 will collect samples from the lunar surface in a mission planned for 2017. Xichang Satellite Launch Center in southwest China’s Sichuan Province, on October 24, 2014.
a future probe that will conduct the country’s first moon mission with a return to Earth. 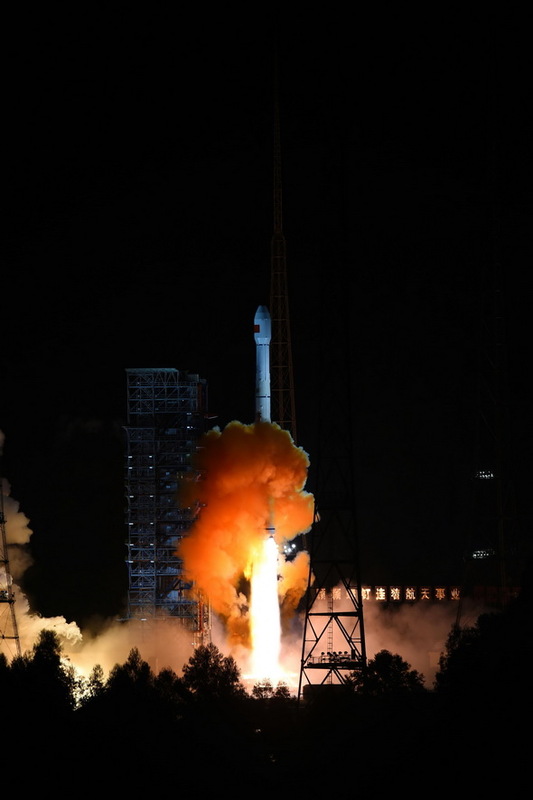 China launched an unmanned spacecraft early on Friday of October 24 to test technologies to be used in the Chang’e-5, a future probe that will conduct the country’s first moon mission with a return to Earth. The lunar orbiter was launched atop an advanced Long March-3C rocket from the Xichang Satellite Launch Center in southwest China’s Sichuan Province. The whole mission will take about eight days. Developed by China Aerospace Science and Technology Corporation, the spacecraft will fly around the moon for half a circle and return to Earth. On its return, the test spacecraft will approach the terrestrial atmosphere at a velocity of nearly 11.2 kilometers per second and rebound to slow down before re-entering the atmosphere. It will land in north China’s Inner Mongolia Autonomous Region. The ongoing second phase saw Chang’e-3 with the country’s first moon rover Yutu onboard succeed in soft landing on the moon in December 2013. Chang’e-4 is the backup probe of Chang’e-3 and will help pave the way for future probes. China’s spacecraft testing technology for the Chang’e-5 return lunar mission, trimmed its orbit on Friday afternoon of October 24. This was the first modification during a journey scheduled to take about eight days, according to a statement from the State Administration of Science, Technology and Industry for National Defense. The modification was necessary because the unmanned spacecraft is affected by external factors during the transfer from a terrestrial orbit to a lunar orbit, according to the statement. Updated software allows monitors in Beijing to spot glitches during the journey immediately and respond to them. The orbiter was launched by a Long March-3C rocket from the Xichang Satellite Launch Center in southwest China’s Sichuan Province on early Friday. Developed by China Aerospace Science and Technology Corporation, the spacecraft will fly around the moon half a circle and return to Earth. The mission is to collect data and validate re-entry technology such as guidance, navigation and control systems, and the heat shield in anticipation of a moon landing by Chang’e-5, which will collect samples and return to Earth, probably in 2017. It is the first time China has conducted a test involving a half-orbit around the moon at a height of 380,000 kilometers before having the spacecraft return to Earth. The ongoing second phase saw Chang’e-3 with the country’s first moon rover, Yutu, on board succeed in soft landing on the moon in December 2013. Chang’e-4 is the backup probe of Chang’e-3 and will help pave the way for future probes. China’s experimental spacecraft, designed to fly around the moon and back to Earth, entered lunar orbit on Monday of October 27 and is making necessary preparations for its trip back home. The orbiter, launched on Friday of October 24 atop an advanced Long March-3C rocket, entered the Moon’s gravitational sphere of influence Monday at noon, and is expected to remain there for the next 32 hours. It is currently orbiting at around 60,000 kilometers from the moon and is making required adjustments for its transfer from the lunar orbit back to the terrestrial orbit scheduled for late Tuesday. The test orbiter will then maneuver on the edge of the Earth’s atmosphere to slow from a speed of 11.2 kilometers per second before re-entry, a process that generates extremely high temperatures. The eight-day program is a test run for Chang’e-5, China’s fourth lunar probe that is aimed to gather samples from the moon’s surface. Earlier reports said Chang’e-5 will be launched around 2017, marking the last phase of China’s three-step moon probe project. China carried out Chang’e-1 and Chang’e-2 missions in 2007 and 2010, respectively, capping the orbital phase, the first phase of a three-step moon probe project. The ongoing second phase saw Chang’e-3 soft land on the moon carrying the country’s first moon rover Yutu onboard in December 2013. Chang’e-4 is the backup probe of Chang’e-3 and will help pave the way for future probes. China’s return lunar orbiter, a precursor to the Chang’e-5 mission, has escaped lunar gravity and is approaching the Earth after 114 hours of flight in space. As of 8:00 pm on Tuesday of October 28, the unmanned spacecraft was flying in a good condition at a height of 360,000 kilometers and is expected to return to the Earth on November 1, said the State Administration of Science, Technology and Industry for National Defense. It was launched early on Friday of October 24 to test technology to be used in the Chang’e-5 mission, a probe that will conduct China’s first moon mission and return to Earth. China will launch a new lunar mission this week to test technology likely to be used in Chang’e-5, a future lunar probe with the ability to return to Earth. The experimental spacecraft launched this week is expected to reach a location near the moon and return to Earth, according to the State Administration of Science, Technology and Industry for National Defense on Wednesday of October 22. The test model is currently ready and scheduled to be launched between Friday and Sunday from the Xichang Satellite Launch Center in southwest China, with the whole mission taking about eight days. “The meteorological condition will meet the requirements for the launch,” said Tao Zhongshan, chief engineer of the center. It is the first time China has conducted a test involving a half-orbit around the moon at a height of 380,000 kilometers before having the craft return to Earth. The return mission will involve the spacecraft entering, exiting, and re-entering Earth’s atmosphere and landing, said the administration. During this process, the spacecraft’s speed will be slowed down so it can land safely at a determined location, a key capability needed for Chang’e-5, which is expected to return from the moon at a velocity of 11.2 kilometers per second, according to the scientists’ explanation. China’s advanced Long March-3C carrier rocket will make its debut during the test. The Chang’e-5 probe, expected to launch in 2017, will be tasked with landing on the moon, collecting samples and returning to Earth. “Apart from the technology of self-returning to Earth, the probe will make breakthrough in sample collecting, moon surface takeoff, rendezvous and docking in lunar orbit,” said Hu Hao, chief designer of the third phase of China’s lunar probe project. China carried out Chang’e-1 and Chang’e-2 missions in 2007 and 2010, respectively. In December, 2013, Chang’e-3 lunar probe succeeded in soft landing on the moon, with the country’s first moon rover on board. The Chang’e-3 mission marked completion of the second phase of China’s lunar program, which includes orbiting, landing and returning to Earth. shows the Yutu moon rover during Chang’e-3 lunar probe mission’s first lunar day circle. China’s ailing moon rover Yutu has entered its 11th dormancy as the lunar night falls, with its functions degrading gracefully, its designer said on Friday of October 10. The rover is currently in good condition and works normally, but its control problem persists, said Yu Dengyun, deputy chief designer of China’s lunar probe mission. “Yutu has gone through freezing lunar nights under abnormal status, and its functions are gradually degrading,” Yu told Xinhua at an exclusive interview. He said that the moon rover and the lander of the Chang’e-3 lunar mission have completed their tasks very well. The rover’s designed lifetime is just three months, but it has survived for over nine. Chang’e-3 mission was the second phase of China’s lunar exploration program, which includes orbiting, landing and returning to the Earth. The program is scheduled to end around 2020. The Chang’e-3 probe was launched on December 2 last year and landed on the moon on December 14. The rover, Yutu, named after the pet rabbit of the lunar goddess Chang’e in Chinese mythology, separated from the lander and touched down on the moon’s surface on Dec. 15. Yutu’s radar started working on December 15 when the lander and rover took photos of each other and beamed them back to Earth. The rover, as its name implies, was intended to roam the lunar surface, surveying the geological structure and substrate while looking for natural resources, but control problems emerged before the second lunar night fell on January 25. The lunar program authorities said the problem was probably caused by the “complicated lunar surface,” including stones and dust, but this has not been confirmed. “We hoped the moon rover would go farther, and we really want to find the true reason why it didn’t,” Yu said, adding that they can only try to deduce the cause via ground-based simulation. Yu said the Chang’e-4 mission is under further analysis. As the backup probe of Chang’e-3, Chang’e-4 will verify technology for Chang’e-5. The more sophisticated Chang’e-5/6 missions are aimed for tasks including unmanned sampling and returning to Earth. China plans to launch an experimental recoverable moon orbiter before the end of this year to test technology vital for the success of Chang’e-5. All 1,333 genes on Chromosome 1 of the zebrafish, which has 85 percent genetic similarity to human beings, have been knocked out by a team of Chinese scientists. The project by the Chinese Academy of Sciences (CAS), Peking and Tsinghua universities and 38 laboratories nationwide, started in February last year. The project knocked out the 1,333 genes one by one, then explained their function, building different kinds of growth and disease models, said Meng Anming, a member of CAS and professor at Tsinghua University. The progress lays a scientific foundation for the study of human diseases and treatment, said Meng, also board chairman of the China zebrafish resource center, at a meeting to mark the end of the project. Zebrafish fin, squama and parts of the heart can replace themselves, which is of significance for the regeneration treatment of human amputatees, according to Meng. Zebrafish reproduce and grow quickly, making it a good choice for life science studies, said Meng. The materials and data of the project will be freely available through the center’s website. Zebrafish research worldwide has a history of more than 30 years. More than 8,000 mutants of the species have been confirmed. 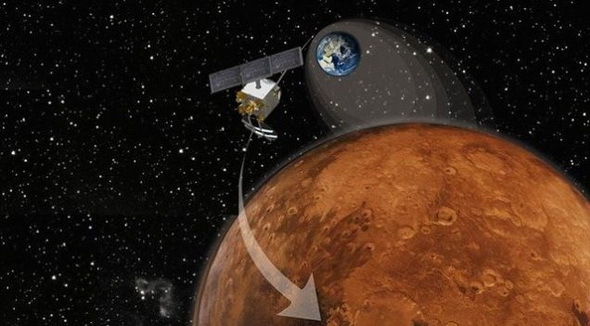 Artist’s concept of Mangalyaan’s orbital insertion around Mars. but some experts have disclosed the country’s interest. Mars receives two visitors from the Earth this week. 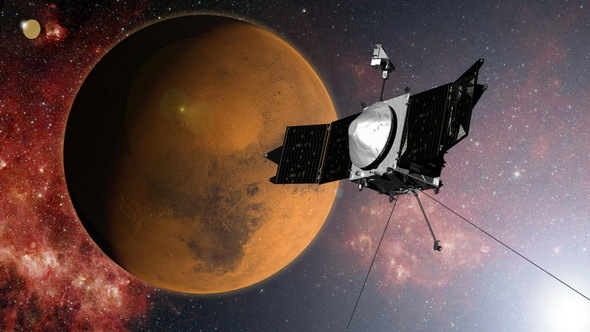 NASA’s new spacecraft MAVEN entered the orbit around Mars on September 21 to hunt for the planet’s lost water. And India’s first Mars probe has reached Mars on September 24, said Indian Prime Minister Narendra Modi, adding that India is the first country to have reached the Red Planet on its first attempt. After China’s successful soft landing on the moon late last year, will Mars be its next goal? No official plan has been published yet, but some experts have disclosed the country’s interest. Ouyang Ziyuan, a leading scientist in China’s moon program, told the International Planetarium Society conference in Beijing in June that China plans to send a Mars rover around 2020, collect samples and bring them back to Earth around 2030. Russia launched a rocket carrying a China-made probe to Mars in 2011, but the mission failed because of an accident in the orbital transfer. Ye Peijian, a leading design adviser for China’s Chang’e-2 and Chang’e-3 moon probes, has called repeatedly during the annual sessions of the national legislature and political advisory body for an early start of a Mars exploration mission. “India has gone ahead of us,” Ye says. Is China capable of probing Mars? Many experts are confident. With current technologies, China could send a probe to orbit and land on Mars in one mission, Ye says. “We already lag behind (India) in time, so we should do it better,” Ye says. Pang Zhihao, a researcher at the China Academy of Space Technology, says there is a good chance that China can send a Mars rover in 2020, since it has the technologies for deep space observation and control. Much of the infrastructure is already in place. Two large ground control stations in Jiamusi, in the northeast Heilongjiang Province, and Kashgar, northwest China’s Xinjiang Uygur Autonomous Region will enable China to conduct long-distance observation and control of spacecraft on Mars. The distance between Mars and the Earth ranges between 55 million kilometers and 400 million kilometers. Experts say China has no problem in communication, observation and control of a Mars probe, even at the farthest distance. According to Sun Zezhou, chief designer of the Chang’e-3 moon probe, China is developing the Long March 5 rocket, which could carry orbiting probes to near-earth asteroids, Venus and Jupiter, and support an unmanned landing on Mars. However, China would need a more powerful rocket to return to Earth, Sun says. Long Lehao, chief designer of the carrier rocket series with the China Academy of Launch Vehicle Technology, says the Long March 5 rocket is expected to be launched by the end of 2015. If successful, it will greatly improve China’s ability to explore space. “Generally speaking, we will have a more powerful rocket than India,” Long says. Chang’e-2 probe has flown about 83 million kilometers from the Earth. “I believe there’s no problem in sending a spacecraft to Mars,” Long says. China could launch a much bigger probe than India’s, he adds. China’s Mars exploration program would likely include orbiting, landing and roving in one mission. But experts say China still faces many technological difficulties. Pang Zhihao says entering the Mars orbit and landing will be very difficult. Both the United States and the Soviet Union had experienced high failure rates in early Mars missions. China needs to develop Mars landing technologies and improve spacecraft autonomous capabilities, experts say.